This seriously chic casual getup is easy to break down: a white and navy horizontal striped oversized sweater and black skinny jeans. With footwear, go for something on the more elegant end of the spectrum and finish off your getup with Linea Paolo Cherie Round Toe Pump. A red plaid pea coat and black leather skinny jeans are must-have must-haves if you're planning an off-duty wardrobe that holds to the highest sartorial standards. Add Linea Paolo red suede pumps to the mix to effortlesslly dial up the oomph factor of this look. If you appreciate the comfort look, dress in a white and black gingham midi dress. Introduce Linea Paolo red suede pumps to the mix to instantly bump up the oomph factor of this outfit. A red crew-neck sweater and black skinny jeans are essential in a versatile casual wardrobe. Rev up the dressiness of this getup a bit by finishing with a pair of Linea Paolo Cherie Round Toe Pump. Consider teaming a red print crew-neck t-shirt with black skinny jeans to don an absolutely stylish outfit. Linea Paolo Cherie Round Toe Pump from Nordstrom will bring an added touch of refinement to an otherwise everyday getup. This combination of a black leather blazer and brown camouflage skinny jeans is pulled together and yet it looks easy and ready for anything. 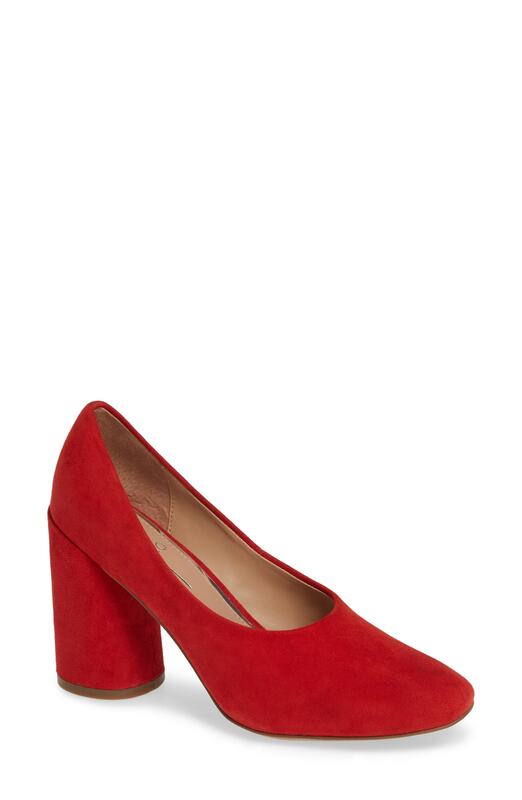 Balance out your ensemble with a classier kind of footwear, such as this pair of red suede pumps. Dress in a white skater dress for a comfortable outfit that's also put together. Add a sultry vibe to this ensemble by finishing off with a pair of Linea Paolo Cherie Round Toe Pump from Nordstrom. 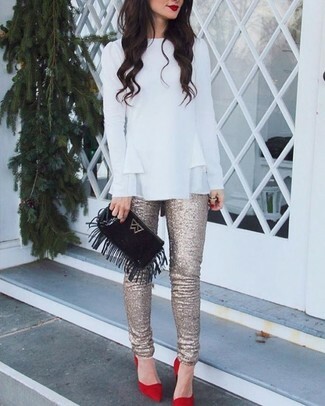 For an ensemble that's extremely easy but can be worn in plenty of different ways, wear a white ruffle long sleeve blouse with gold sequin skinny pants. Introduce red suede pumps to the equation and ta-da: the outfit is complete. This laid-back pairing of a white button down blouse and beige culottes is a fail-safe option when you need to look chic but have no time to spare. Red suede pumps are an effective way to add a dose of elegance to this outfit.